New Feature: Now you can open and edit invoices from within the Auto Provider Reconciliation in the Cellular Matched and Not Matched sections of TeleTracker..
button on the Data Compare window. This button shows Activations in which the Phone #'s match, but the commission amounts do not match. 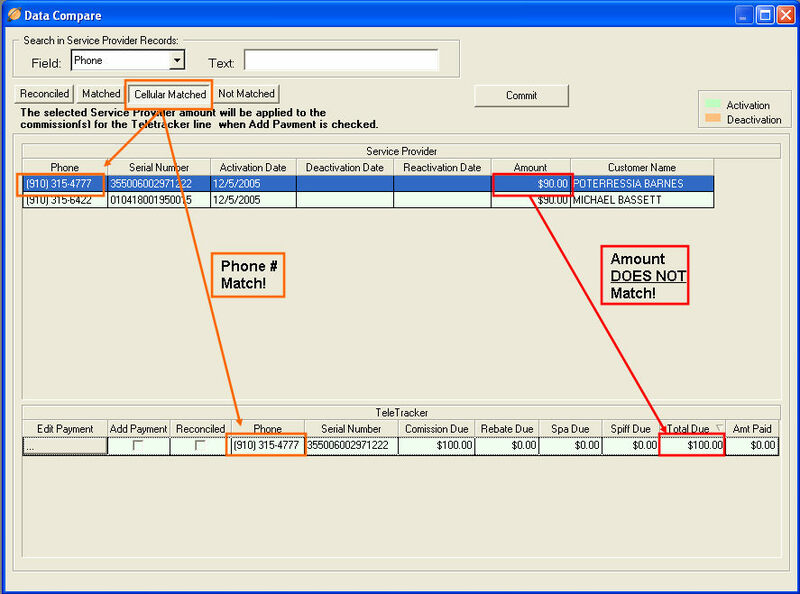 Edit the payments by entering the appropriate amounts into each of the respective commission fields. A partial payment may be entered into this window. You may add additional payments at a later time to the same activation in the Manual Reconciliation. If necessary, you may also enter a commission amount greater than the amount due specified by the Service Provider. : Check the Add Payment box to add the payment amount specified by the Service Provider. : Place a check in this box to mark the Activation as reconciled. Clicking the Commit button will only effect the Activations shown on the current active button. In this case, only Activations on the Cellular Matched button with a reconcile checkmark will move to the Reconciled button.